作者: The AsiaN Editor on 18 September , 2018. South Korean President Moon Jae-in, second from right, is greeted by North Koreans as North Korean leader Kim Jong Un, right, watches during a welcome ceremony at Sunan International Airport in Pyongyang, North Korea, Tuesday, Sept. 18, 2018. 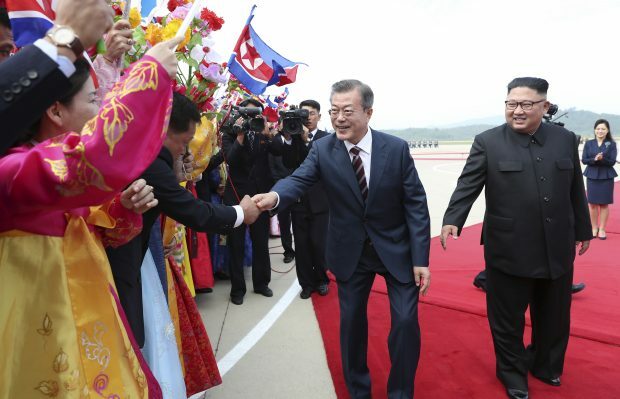 North Korean leader Kim Jong-un welcomed South Korean President Moon Jae-in with a big smile at Sunan International Airport in Pyongyang, Tuesday. Kim and Moon embraced and flashed wide smiles, after Moon and his wife Kim Jung-sook walked out of the presidential plane at around 10:08 a.m. The two leaders will hold formal talks from 3:30 p.m. to 5 p.m. A military honor guard welcomed them with a special ceremony and its leader called Moon “Your Excellency.” After watching the performance, Moon shook hands with people in the cheering crowd, some waving Korean unification flags. Kim’s wife Lee Ri Sol-ju, his sister Kim Yo-jong and North Korea’s top officials ― including head of parliament Kim Yong-nam and ruling party vice chairman Choe Ryong-hae ― also greeted the guests. And then, the two leaders took separate vehicles to go to Paekhwawon, a state guesthouse, where Moon and his wife are expected to stay during their visit. Thousands of Pyongyang citizens welcomed Moon’s visit on the streets, waving flowers and applauding, as the vehicles were heading to the place. Moon and Kim are now set for their first summit in the North Korean capital after meeting twice this year at the shared village of Panmunjeom in April and in May. Moon’s plane, which left Seoul Airport in Seongnam at 8:40 a.m., took an indirect route along the Korean Peninsula west coast before landing in Pyongyang 70 minutes later (at around 9:50 a.m.) Moon’s three-day trip comes amid a deadlock in denuclearization talks between the United States and North Korea. Before flying to Pyongyang, Moon said he would seek to mediate a breakthrough in the talks. “What I want to achieve is peace,” he said. “Not a tentative change that could be volatile depending on the international situation, but an irreversible, permanent and unwavering peace, regardless of what might happen in the global arena,” Moon said on Twitter ahead of his departure. Moon’s entourage includes K-pop stars and nearly a dozen business leaders, including Samsung Electronics Vice Chairman Lee Jae-yong. By Jung Min-ho, Joint Press Corps.